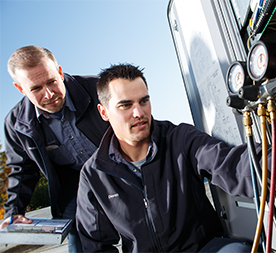 On Tuesday, April 19th, 2016, experienced Reitmeier HVAC professionals Adam Tucker and Michael Taal lead an in-depth discussion around why HVAC maintenance is essential for building performance – including a maintenance demonstration on a working HVAC unit. Those who work with or manage HVAC equipment and systems at commercial building facilities — property managers and facility maintenance personnel. This event has already taken place, but we may cover this topic again in the future. To see a full list of The Exchange’s upcoming events or submit a topic request, click here!